Go, Tracy, Go! 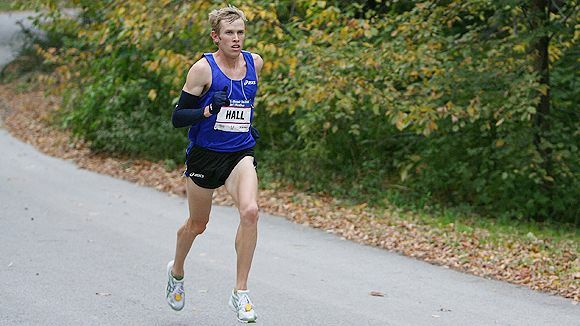 : BREAKING NEWS FROM THE WORLD OF RUNNING! If you look closely, I think you can see his junk. Stop the press! Ryan and Sara Hall have left their coach, Terrence Mahon. I think this is the closest thing to a celebrity breakup that we runners get. Does this mean there's an opening in Mammoth for new runners? What do you think - should I apply before someone else seizes my opportunity? I'm sure with that level of training I could finally bring my 5k PR closer to 25 minutes. and forever relegated to being "the heavy guy from Blues Traveler." 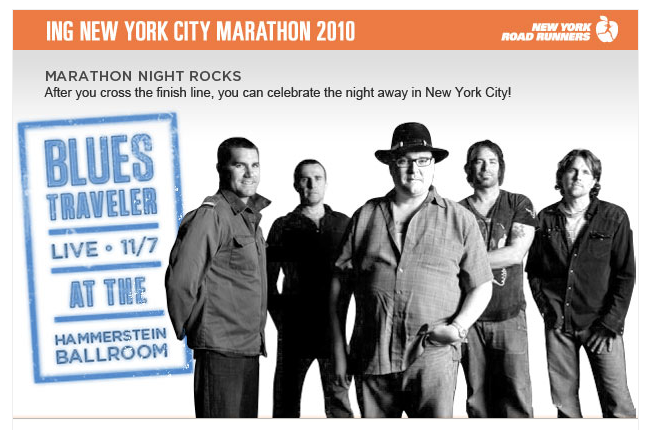 You heard it here first: the NYCM is officially holding a post-marathon concert with Blues Traveler as the band. Their email stated that tickets would be free (plus a guest!) for runners, but the fine print is that they're only giving away 1,000 tickets, and those are being given out at random times during the expo. 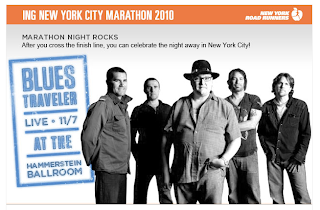 I know Blues Traveler has their fans and all, but the song the NYRR chose to promote the concert is Run-Around. You know, that annoying harmonica song that was popular as I was graduating high school... 15 years ago. Evidently they would like us to run so fast that we actually go back in time. And finally, TAPER MADNESS IS REAL, PEOPLE, IT'S REAL! In a fit of delusion, I decided yesterday that I need need need new running shoes for the race. I mean, my current shoes have more than 100 miles on them; how can I possibly run another marathon in them?!? In the process of trying on the new shoes, I went to zip up my adorable, fashionable leather boots... and the zipper broke. Cold broke. I was forced to wear my running shoes with my normal clothes in a throwback to the '80s commuter businesswoman look. Super chic, no? In a moment of temporary insanity I thought your purse was a baseball glove. Umm. Well. At least you wear your running shoes for running when you are not pulling a "Working Girl." When I see walkers buying Kayanos, I shake my head. And wish I were that wealthy. first of all, I'm cracking up at my desk re: your first photo caption. That is surprising news, though! P.S. I now have that Blues Traveler song in my head - GAH! Sarah - you mean you don't wear baseball gloves at all times, you know, just in case? It's actually a decorative scarf but now that you point that out it totally looks like a glove.